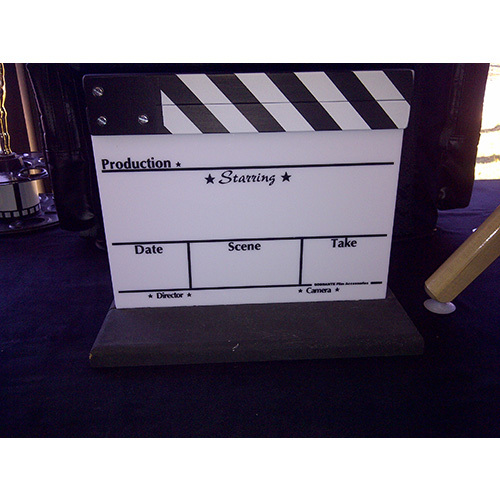 This acrylic trophy slate is ideal for gifts, promotions, or decorations. These acrylic slates measure 11" x 9" including the sticks. The board is made of acrylic but unlike our professional slates, the markings are silk-screened instead of engraved. This means that they look great but aren't suited for heavy and repeated professional use. The sticks are a slimmer profile than on our professional slates and do not contain the magnet. These make a great gift or decoration for the cinephile, they are ideal as trophies or promotional products, and they can be used effectively on amateur productions.